Before the brick was installed we added flashing at joint of frame and slab on exterior walls. 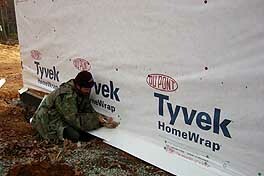 The flashing is placed UNDER the Tyvek, so that water flows down and away from the foundation walls. 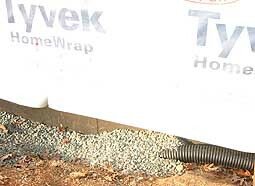 A drain pipe runs around the entire perimeter of the house to wick water away from the foundation. Then the pipe is covered with gravel. 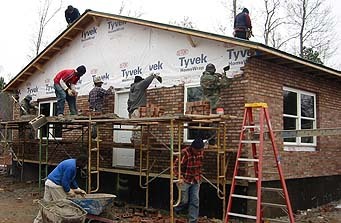 On a cold mid-December day, the brick and roof installation both began. 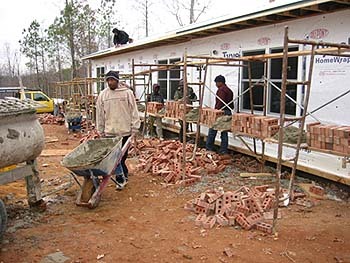 We chose brick for its durability, low maintenance and longevity. It holds up in high winds and ice and doesn't need maintenance that siding and other facades require and is durable for at least 100 years. We chose a tumbled brick with a design reminiscent of the homes in England, and it looks good with the green metal roof. Leroy Cheek and his company did a very detailed job enhancing the natural beauty of the brick. We chose the brick and we let the artist/mason do his job and we feel we ended up with a far superior and professional result. Nothing was rushed, there was substantial manpower to see the job was done right and yet they still finished ahead of schedule. The goal of Project Home is low maintenance and simplistic beauty, and this was achieved. Because power washing would remove the sand finish, extra care had to be given to the removal of wet mortar as they went along. Flashing, drainpipes - Harrelson's Home Improvement Company.